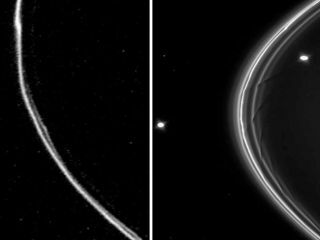 NASA's Voyager 1 spacecraft revealed the kinks in one of Saturn's narrowest rings. The Voyager 1 image (left) was released on Nov. 12, 1980. The closer view of the F ring (right) was obtained by NASA's Cassini spacecraft on April 13, 2005. The moon Pandora is to the left (exterior) of the ring and the moon Prometheus is to the right (interior) of the ring. It's been 30 years since NASA's twoVoyager spacecraft firstvisited Saturn, but the legacy of the discovery created by the probesstilllingers at the ringed planet today. These findings alone openedastronomers' eyes to therichness of the Saturn system. But the Voyager encounters sparked somany newquestions that another spacecraft, NASA'sCassini orbiter, was sent to probe those mysteries twodecades later,researchers said. "When I look back, I realize howlittle we actuallyknew about the solar system before Voyager," said Ed Stone of Caltech,aproject scientist for the Voyager mission back in the day. "Wediscoveredthings we didn't know were there to be discovered, time after time." While the Cassini mission has been acooperative effortbetween NASA, Italy and the European Space Agency ? which built a Titanlanderthat rode piggyback on Cassini ? the twin Voyager probes launched in1977 solelyas NASA missions are, today, thespacecraft farthest from Earth. Voyager photos, for example, showedhuge storms roiling Saturn'satmosphere ? something that Earth-based telescopes hadn't picked up,researchers said. And the spacecraft also discovered strange kinkedpatterns inSaturn's F ring, discovered only the year before by NASA's Pioneer 11probe. The two Voyagers also revealed thatthe surface ofEnceladus, Saturn's sixth-largest moon, was surprisingly young inplaces,pointing toward recent geological activity. Scientists used Voyager observationsto resolve debates overwhether Titan's atmosphere is thick or whisker-thin. The Voyagers foundTitanto be shrouded in a thick haze of hydrocarbons in a nitrogen-richatmosphere,leading scientists to predict that seas of liquid methane and ethanemight dotthe moon's surface, researchers said. "It was clear Voyager was showing ussomethingdifferent at Saturn," Stone said. "Over and over, the spacecraftrevealed so many unexpected things that it often took days, months andevenyears to figure them out." After the success of the Voyagerflybys, Saturn was againalone until 1997. That was when NASA launched the Cassini spacecraft,whicharrived at the ringed gas giant in 2004 and has been following up onVoyager'sobservations and blazing new trails ever since. Cassini has helped astronomers answersome of the questionsthe Voyager flybys raised, NASA said in a statement. The probe hasdiscovered amechanism, for example, that explains the young terrain on Enceladus:tiger-stripe fissures that blast out jets of water vapor and organicparticles. Cassini has also revealed that Titandoes indeed have stablelakesof liquid hydrocarbons on its surface, showing what a closeanalog thatfrigid moon may be to a young Earth. The probe has resolved how twosmall moonsdiscovered by Voyager ? Prometheus and Pandora ? tug on the planet's Fring tocreate its strange, kinked shape, researchers added. "Cassini is indebted to Voyager forits manyfascinating discoveries and for paving the way for Cassini," said LindaSpilker, Cassini project scientist at JPL, who started her careerworking onVoyager. "On Cassini, we still compare our data to Voyager's andproudlybuild on Voyager's heritage." Cassini's main mission to Saturnended in 2008 and theexpedition has been extended twice, with the probe scheduled to finishitsstudies of the planet in 2017. That extension is key because theVoyager probes left a fewmysteries that Cassini has still not yet solved. For instance, scientists firstspotted a hexagonal weatherpattern when they stitched together Voyager images of Saturn's northpole. Decadeslater, Cassini obtained higher-resolution pictures of the odd weatherformation, which suggests remarkably stable structure. But researchersstilldon't know what is causing the atmospheric oddity. The two Voyager spacecraft launchedin 1977 with the primaryaim of exploring Jupiter and Saturn. But both probes kept on flyingafteraccomplishing this task. Between them, the two spacecraftexplored the solar system'sgas giants ? Jupiter, Saturn, Uranus and Neptune ? and 48 of theplanets'moons, according to NASA officials. Voyager 1 and 2 are still going,exploring the outer reachesof the solar system. They've both made it to the outermost layer of theheliosphere, where the solarwind is slowed by the pressure of interstellar gas. Voyager 1is about 11billion miles (17 billion km) from the sun, while Voyager 2 is about 9billionmiles (14 billion km) away, researchers said. Even as the most distant human-builtobjects in space, both Voyagerprobes are still making scientific observations and beaming data home,according to NASA officials.